Monster Worldwide was acquired by Randstad for $429 million. Monster’s market cap is $310 million, on revenues of about $667 million. Compare that to Microsoft’s acquisition of LinkedIn for $26 billion, about the same as the company’s market cap, with revenues of about $3 billion. LinkedIn is a money-losing business and Monster is a profitable company. If Monster was valued the same way as LinkedIn, the company would have sold for $6 billion. Monster is one of the early successes of the Internet. It was one of the first commercial sites on the web. The company’s story is the stuff of legend — the board started out in 1994 providing searchable job ads taken from newspapers, using a single server in a phone closet. The first office was a couple of rooms above a Chinese restaurant in Boston. Monster changed the way people searched for jobs and how employers filled open positions. It owned two blimps emblazoned with its trademark characters, advertised on the Super Bowl, and became a sponsor of the 2002 Olympics in Salt Lake City. Following an acquisition by TMP, the company went public in 1996 at an IPO price of $7. In 2000, TMP/Monster was valued at more than $8 billion. At its peak, the stock was $91. Randstad is paying $3.40/share. So what happened? Why such a massive disparity in valuation between LinkedIn and Monster? How did a company that at one time was the dominant player in the recruiting industry and practically defined online recruiting fall so far? 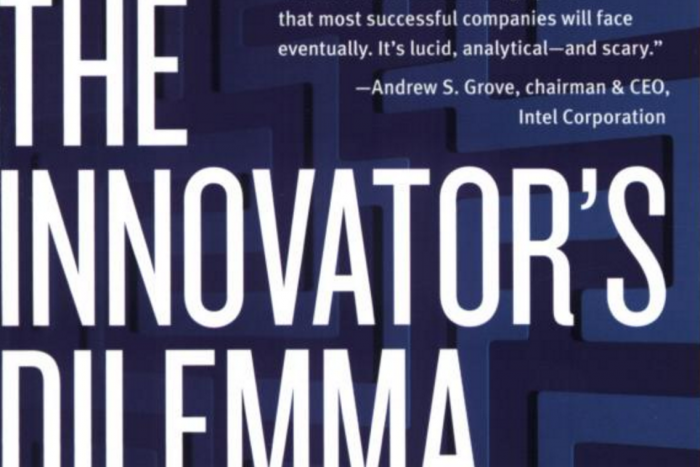 In his bestselling book with the above title, Harvard professor Clayton Christensen makes the case that successful companies fall behind because they often put too much emphasis on customers’ current needs, and fail to adopt new technology or business models that will meet their customer’s’ unstated or future needs. Disruptive technologies and innovations are not developed because there is no current market for them. Monster’s early success in bringing together employers and job seekers exceeded all expectations. The model was a simple one: provide a searchable database of job ads for job seekers and one of resumes for employers. The vision was to provide an easy way for employers to make hires … post a job and wait for the resumes to pour in. And it worked and still does; job boards are a leading way to fill vacancies today and rank just behind social networks as a source of quality hires. But Monster never delivered on its founder’s complete vision. Monster was founded by Jeff Taylor. The term “social network” did not exist when Monster was created, but Taylor had realized the potential of the Internet. His original vision for the site was a place where people constantly kept skills and work histories up to date, even when they weren’t looking for jobs. He talked about “profiles” on the site, not resumes. Does that sound like something else? Monster launched Monster Networking following the launch of LinkedIn, but it never caught on, mainly because it was modeled on dating sites and required every user to pay a membership fee. It took a long time before it was realized that the most value to be had from the Internet is data. The success of Google, Facebook, LinkedIn, and many other firms is founded on their being able to tap the value from data gleaned from billions of interactions that occur online. LinkedIn can better match people to jobs and suggest candidates for recruiters to consider because it has access to vast amounts of data from members and employers. Job boards were well positioned to collect data, but when they emerged it was far from obvious that data had much value. Monster brought online the method by which jobs had been filled for over a century (The first job ads were placed in newspapers in 1836). This was a cool idea in 1996, but employers were soon demanding more. Online marketing was becoming very focused, and retailers were rapidly being able to target customers with a high degree of precision. The same was expected of recruiting — candidate marketing, predictive analytics, and pipelining candidates based on where they were in their careers. None of this is feasible without data, and boards like Monster were not seen as being able to provide it. The void was filled by LinkedIn and other technology vendors that capitalized on data. Job boards are not obsolete — millions of jobs are filled through postings on Monster and other sites. Monster remains a popular site — Alexa ranks Monster as the second-most-visited job site, behind Indeed and ahead of CareerBuilder. But job boards today provide a commodity service, so there’s little to distinguish one from another, and they can mainly compete on price. Having a large volume of online traffic is not enough value to command a premium. In a race to help employers win the war for talent, job boards like Monster lost the leadership position a long time ago.